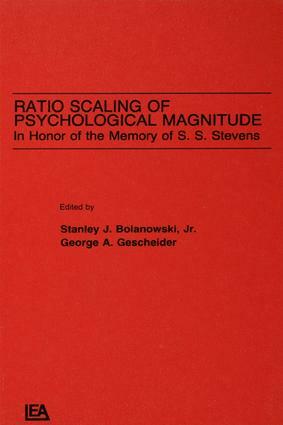 Presenting the proceedings of a conference held at Syracuse University in honor of S.S. Stevens, a pioneer in the scaling of sensory magnitudes and the originator of the method of magnitude estimation, this volume brings together the work of 20 authorities on the procedures of ratio scaling. These experts--psychophysicists, physiologists, and theoreticians--offer their views on whether or not psychological magnitudes can be measured and whether the judgments of psychological magnitudes constitute the basis for the construction of a ratio scale. Also discussed is the question of whether any single method could stand out as a potential standard technique for measuring psychological magnitudes. "…a precious time capsule of a methodology and world view, which has been given the attention and opportunity to grow and mature. The subject matter and the treatments of issues and problems dealt with in this book bear fine witness and honor to Stevens' vision forty years ago." Contents: G. Stevens, Preface: A Small Oral History. G.A. Gescheider, S.J. Bolanowski, Jr., Introduction to Conference on Ratio Scaling of Psychological Magnitudes. R.D. Luce, What Is a Ratio in Ratio Scaling. J.J. Zwislocki, Natural Measurement. L.E. Marks, The Dynamics of Ratio Scaling. J.C. Stevens, Magnitude Matching: Application to Special Populations. M. Guirao, A Single Scale Based on Ratio and Partition Estimates. L.M. Ward, Associative Measurement of Psychological Magnitude. L.E. Krueger, Toward a Unified Psychophysical Law and Beyond. B.J. Cowart, Derivation of an Index of Discrimination From Magnitude Estimation Ratings. E. Galanter, T.E. Wiegand, Multiple Moduli and Payoff Functions in Psychophysical Scaling. M.B. Berglund, Quality Assurance in Environmental Psychophysics. R.B. Barlow, Jr., Brightness Sensation and the Neural Coding of Light Intensity. D. Algom, W.S. Cain, Chemosensory Representation in Perception and Memory. B. Scharf, Loudness Adaptation Measured by the Method of Successive Magnitude Estimation. R.P. Hellman, Loudness Measurement by Magnitude Scaling: Implications for Intensity Coding. S. Namba, S. Kuwano, The Loudness of Non-steady State Sounds: Is a Ratio Scale Applicable? L.M. Bartoshuk, Ratio Scaling, Taste Genetics, and Taste Pathologies. R.T. Verrillo, Measurement of Vibrotactile Sensation Magnitude. S. Bolanowski, Jr., J.J. Zwislocki, G.A. Gescheider, Intersensory Generality of Psychological Units. G.A. Gescheider, S.J. Bolanowski, Jr., Final Comments on Ratio Scaling of Psychological Magnitudes.